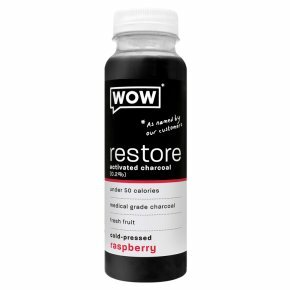 A blend of Activated Charcoal, Raspberry Puree, Lemon Juice, Agave Syrup & Filtered Water. Activated charcoal (0.2%). Under 50 calories. Medical grade charcoal. Fresh fruit. Cold-pressed. Made from recycled coconut husks, our medical grade activated charcoal restores your body. With freshly squeezed juice. Activated charcoal is wonderfully powerful and has adsorbing capabilities. We recommend consuming this drink at least an hour before or after medication.